This is a tough job market. However, for some, it’s not so tough. If you have been networking, it seems this is where all of the leads are. With countless resumes and applications being filled out and turned in, how does anyone ever expect to stand above the noise? Quite frankly, if I were an employer with a job opening, how in the world can I expect to work through all of the potential inquiries? One mistake I do believe some employers are making right now is with immediately turning people away because they are over qualified. Really? In this economy, that immediately takes away a good percentage of the potential work force. But why not hire someone who is over qualified? A. Do they intimidate you? Do you feel that they will soon show you up and therefore steal your job away from you? Have a little confidence in your work ethic and performance. Quite frankly, when I was hiring people, I always wanted to find those who were much better at me in specific areas. In this, I nurtured a team culture as well as actually learned a thing or two. B. How do you know they will immediately take another job once the economy recovers? Have a little confidence in your culture. I think people are wising up to the quality of their work experience as a major player versus making a bunch of money… no matter what and at all costs. C. Face it, experience does count for something, even if it is not an exact match with your “job requirements”. You have to remember that with experience, often times, comes wisdom. What would it hurt to at least interview an over qualified prospect? If you are asking the right questions, you may just learn a thing or two that could open your eyes to the potential this prospect could bring to your company for both the short and/or long term. 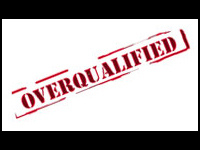 Ask yourself this… Could there be a long term benefit to having a short term employment of an overqualified employee? How do you know the one you are hiring is going to stay? If you eventually have to pay out those unseen turnover costs, why not seek some return on investment? D. I can’t afford them or the benefit packages we offer? Really, how do you know this? Have you stopped and seriously looked at what’s out there right now? These folks are not dumb, they know what they are applying for. And quite frankly, they are probably not applying for anything and everything that is out there. Thus meaning, they are being selective and perhaps have done their homework. They also are well aware of the current governmental policies that are effecting businesses today. Therefore, you don’t know if you don’t ask. If you got someone that you like, at least call them. The sad thing about this over abundance of over qualified talent is that in the current workforce today, there is an over abundance of under qualified talent making most of the decisions that upper management is not in tune with. My goodness, when will people wise up to the impact this has on the morale which directly impacts the productivity of an organization? Yet still, in an economy of millions of prospects with huge potential, some employers will go months and months without hiring for a much needed position because all of the applicants are too overly qualified. All the while, they burn their current workforce out by tacking on more and more responsibilities to each of them. This impacts morale and productivity. Isn’t the point to have high morale and high productivity? Why are you so afraid of this or cannot you see this for what it is? Quite frankly, A company or organization that chooses not to hire over qualified prospects in this day and age, should be taken as a good sign that this is a company not worth working for. It shows potential for: lack of confidence, insecurity, and lack of vision. I believe that standing in the unemployment lines are a whole lot of people with vision, experience, leadership skills, exceptional decision making abilities, innovators, and a whole lot of other gifts that can help turn this economy around and more specifically, your organization around. Golly, at least give them a chance to interview. So, don’t be too quick to write off these people. Because, for every ten of them, there are 50 under experienced out there drawing a pay check and quite frankly are the cause for so many organizations ceasing to exist each day. Do you want status quo or do you want to put your organization on the go? Then don’t be afraid to hire up. It will bring you more than you will ever imagine. It will also show that you are not afraid to learn from others and send a message of confident leadership to the other employees. So, what gives me the right to write this? A few years ago, I had to rebuild a team for a company I was placed in charge of. In this, I sought to fill key positions with people that were much more qualified in them then I. In some cases, they were 5-10 years older then me. For some, this would be intimidating. But, those were the best decisions I ever made as we took a company in two years from over a million dollar loss to over a 100k profit. Sure, it would have been easy to attempt to hire people with less experience that I could “control” or just sought to get more out of the people I had. But, I wanted to win. To do that, I had to lose my ego and hire up. The result… well, decide for yourself. How bad do you want it? It starts with you and your willingness to see the sea of prospects for what they are… really, really good. Next Next post: How will YOU answer the CHILD? But the reaction to this idea was muted at best. How ironic that in an industry with 100 to 150% turnover every year wouldn’t be willing to try something new! What showed up in my office as a ton of enthusiasm on interview day, often becomes more soured and negative after a few months on the job once the realities of the position set in. Do they get frustrated and leave? Actually, not that often. But there are far worse things than a disgruntled employee leaving (they could stay and make things worse). I guess that sentiment impacts me a little. Yeah, we all need jobs, and yeah, they’re hard to come by right now. But part of the reason I have my job is that I don’t just fill seats with warm butts. I find people who fit, and fit well. I have to, if I want to keep doing what I do. The person who commented on your piece in September makes excellent points, and their company was obviously smart to hire and retain them. But I have to say that any industry with 100% turnover in a year won’t solve the problem by hiring higher-qualified candidates, and is more likely dealing with some pretty severe management or training issues. Desperate times might drive people people into jobs they wouldn’t otherwise take. In some cases I’m sure that’s a good thing (I do think a key to economic recovery depends in part on innovation and some calculated risk-taking). Maybe a lot of good things happen when an ex-financial advisor takes a job installing cable for comcast, or vise-versa. Marc, love your insight!!! It is such an interesting topic with so many angles to discuss. Thanks for bringing your experiences to the post.